A new Tamil-Brahmi inscription of the sangham age has been recently discovered on a hill at Mettupatti near Madurai. The new inscription was noted by Prof. P. Pandiyaraja of the American College in a natural cavern in Sitharmalai where many short inscriptions were discovered at the beginning of the century. The new inscription is found near the brow of a big cavern on the ceiling and is near some stone beds. These beds have deeply-cut Tamil-Brahmi inscriptions which are well known to scholars. Madurai city which is about 50 kms away is visible from the cavern. The new inscription refers to one Amanan (Jain) from Mathirai (Madurai). The inscription shows that the ancient name of Madurai was Mathirai and that Jain ascetics lived at Sitharmalai on the banks of Vaigai river over 2000 years ago. There are some very interesting features which are peculiar to this new inscription. The last word ends with the peculiar letter SA. This kind of unusual position of the letter SA has been reported only from some Saatavaahana coins of the second century A.D. where the letter is taken as a genitive suffix. Also it has been held that the system of ligatures or clustered consonants which is found in the Asokan inscriptions was alien to Tamil-Brahmi writings. Here for the first time we see a combined letter NTE which is obtained by writing the letter T below the sign for NE. The inscription is about one metre long and the letters are not deeply engraved. The text can be tentatively read as A MA NA N MA TI RAI A T TI RA N UNTE U TA YA N SA which means "(the dwelling) of Utayan alias Attiran who was a Jain from Madurai". The letters have to be read in the typical early Tamil-Brahmi system which differs from the Asokan system. For instance the word MA TI RAI (the ancient name of Madurai city) would be read differently as MAA TI RAI if one were to follow the Asokan system. The words Attiran and Utayan may be taken as personal names. If one assumes that the inscriptions were not written with great care then several other readings are possible. For instance one can read UTAYAN as UTIYAN, a name for a branch of the Chera Kings. Alternatively UNTE UTAYAN may be read as UNDHI UDHAYAN or Brahma where UNDHI means navel. The word UN may refer to flesh (spelt with the wrong N) and UNTE could refer to one who lost weight doing penance. The word ATTIRAN may also be read as AATTIRAN, an alternative form of AATIRAIYAN or AATREYA. 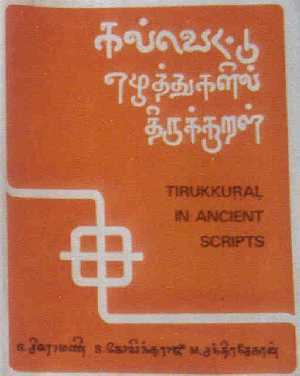 Even though a number of Tamil-Brahmi inscriptions have been discovered, there is still considerable variation in the readings offered by scholars and the general question of the origin of the Tamil-Brahmi script is yet to be settled satisfactorily.